When Constantine the Great was proclaimed emperor in York in A.D. 306 he became ruler of an empire which stretched from Spain and North Africa to Syria – a huge territory populated by hundreds of different peoples of all social classes. Despite the ‘romanized’ lifestyle long enjoyed by citizens in many of the provinces, political control of such an empire was only possible through the mustering of substantial military forces, and these needed to be kept loyal. The problem of maintaining the allegiance of the army had preoccupied Roman leaders since the days of the Republic, and since earliest times the commanders had been dependent on the regular payment of bonuses and gifts to ensure their followers remained loyal. 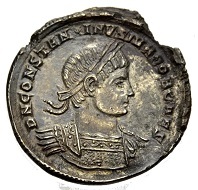 Constantius II Caesar, 317-337. Miliarense, Sirmium. From Münzen & Medaillen sale 45 (June 9, 2017), no. 119. That the emperor himself was seen as being responsible for such gifts had its roots in the age-old patron-client system of Rome, in which aristocrats supported followers of lesser rank and expected loyalty and certain services from them in return for their own financial or political (or other) efforts. Much of Roman society functioned through these inter-dependences, and of course gifts played an important role. Under the Republic, it had been the custom to reward soldiers at the end of their military career with a parcel of land, but as the armies increased this became an increasingly unrealisable option and instead veterans were rewarded with a sum of money. Gifts from the emperor in return for loyalty were a feature of the Roman Empire from the start – Augustus distributed bonuses in money in 8 B. C. to celebrate the entrance into the military of his grandson Gaius, and left a sum of money to be distributed upon his death to ease the accession of Tiberius. The so-called donativum soon became an expected part of the transfer of power at the beginning of a new emperor’s reign. 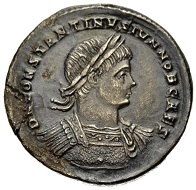 Constantius II Caesar, 317-337. Miliarense, Sirmium. From Münzen & Medaillen sale 45 (June 9, 2017), no. 120. The Roman authors Tacitus and Suetonius distinguish between the donativum, a gift to the soldiers, and the congiarium, a distribution of money among the civilians (‘donativum militi, congiarium plebei’, Tac. Annales XII,41; ‘…populo congiarum, militi donativum’, Suet. Nero, VII,6). Pierre Bastien suggested that they took place to celebrate the emperor’s arrival at a particular place, a particular date such as a birthday, consulate or five-year anniversary, the celebration of a victory or an anniversary of a city such as Rome or Constantinople. 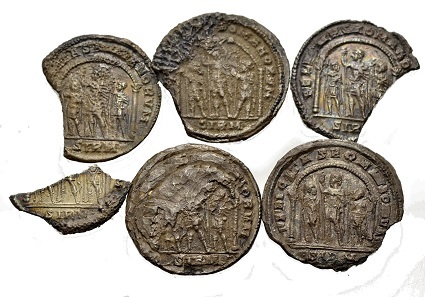 In the case of the Miliarenses from the collection of Markus Weder, which were minted under Constantine the Great (No. 1047, Lot) and Constantinus II. Caesar (Nos. 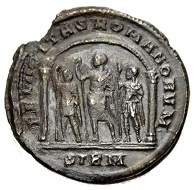 119 and 120) in Sirmium, it is not completely clear whether a military or civilian recipient was intended, although the depiction of the Emperor in military attire standing between his two sons perhaps suggests the former. It is also unclear in which context they were minted and distributed, but it was presumably an occasion strongly associated with the imperial household, given the prominence of the emperor and his sons. The Miliarense was a large silver denomination introduced by Constantine more than halfway through his reign in the 4th Century A.D. It would have been worth considerably more than the bronze coins which made up the bulk of the money in circulation at the time, and probably did not form part of the everyday monetary system: such items would have been kept by their owners as special keepsakes, a reminder of their loyal service, and may have been regarded more as a medallion than as a coin. 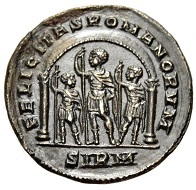 The Miliarense was also the first silver coin to be issued since the Tetrarchy, giving it a special prominence. Multiple lot of miliarense fragments. March 317, Sirmium. The busts of Constantinus I resp. Constantinus II Caesar. From Münzen & Medaillen sale 45 (June 9, 2017), no. 1047. Nos. 119 and 120 in the auction were minted in the name of Constantinus II Caesar in Sirmium, in what is now modern Serbia. This was one of the four capital cities of the empire during the Tetrarchy and the capital of the prefecture of Illyricum, and thus one of the major mints and military centres of the time, fed by strong links to the silver mines of the Dinaric Alps. The coins depict the young Caesar Constantinus (who, born in 316 or 317, was still a very young child at the time) as a military leader, wearing a cuirass with drapery over the left shoulder and a laurel wreath on the obverse and as a youth armed with a spear alongside his father Constantine the Great and his brother Crispus (born ca. A.D. 300) under an arch on the reverse. The group portrait was a strong symbol of family unity and underlines Constantine’s construction of a family dynasty- replacing Diocletian’s concept of a Tetrachy, which had been a revolutionary attempt to overcome the problem of rival family members vying for rule, but which had proved unsuccessful. Milarenses such as these are not common, even as fragments, as in Lot 1047. The examples offered here stem from the collection of the recently deceased Markus Weder, a connoisseur of Roman imperial coins. 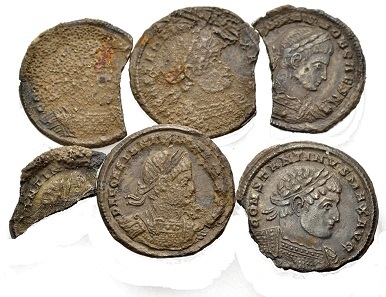 They form part of an interesting array of Roman (and Greek) coins offered in Münzen & Medaillen GmbH Auction 45, alongside many other coins struck by lesser-known emperors and rare denominations. You will find more information about the Münzen & Medaillen sale in their auction preview. And this is the direct link to the auction catalogue at Sixbid.